We were delighted to be visited recently at the museum by Stephen Foot, the grandson of CSM Richard Fuller who served with the 1/18th Battalion on the Western Front during the First World War. 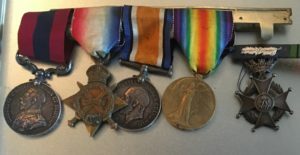 Stephen kindly brought along his grandfather’s Distinguished Conduct Medal, which was awarded to him for his remarkable actions at “Happy Valley” in France on 22nd August 1918. 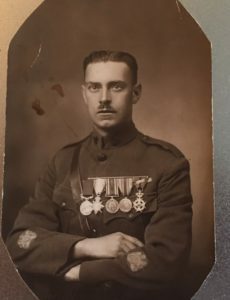 Rather unusually CSM Fuller was also awarded the Belgian Order of Leopold, which was only given to three men in total from the 47th London Division. 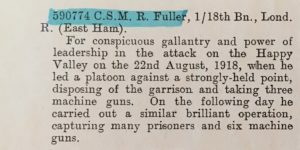 Following his distinguished service with the London Irish Rifles, Richard Fuller joined the Royal Irish Rifles and served for several years with that Regiment – he even joined up again with the Home Guard in 1939. A remarkable man and we have now some most remarkable memories to treasure.